This is a simple tool that can calculate the price of wine at any point in the supply chain, knowing or surmising the price at any other point in the supply chain. 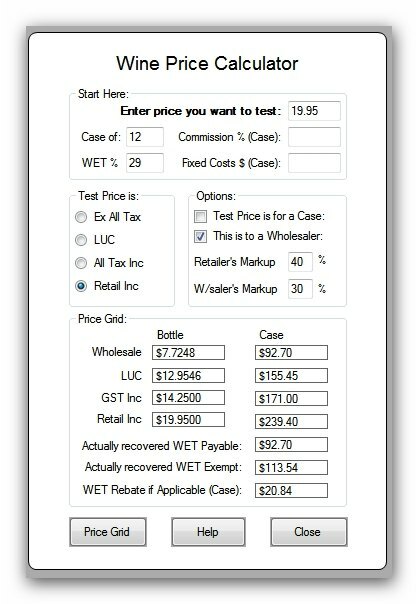 The tool is probably only useful for Australian producers, as it deals with two taxes GST and WET, which may be unique to Australia. If, for example, you wanted your wine to sell at $25 a bottle at bottle shops, and you expect the retail markup to be 40% and wholesale markup to be 30%, then the calculator will tell you the farm gate price - the price you have to sell to the wholesaler. The calculator suggests you need to charge $9.6802 a bottle, $116.16 (Ex WET) for a case of 12, and if you are eligible for a WET rebate, like most wineries are, then that is an additional $26.11 for a case or a total recovered cost for the wine of $142.28. You can download the Wine Price Calculator here. This tool is free, and can be used, distributed and abused in any way you see fit. You must however make sure you understand the figures the calculator tells you - we can't take responsibility for any decisions you may take by using this tool.